As the holiday season draws nearer, the standard Christmas problem is once again rearing its ugly head. After all, one can only give so many pot holders, toasters, socks, sweaters, and pajamas before the time comes for something a little more special, a grand gesture that lets family members and friends know that they are meaningful and deserving of the absolute best. Thankfully, Zigge Holmgren, of Post Art Studio, has come up with the perfect gift: you. For as little as $270, Holmgren places a customer's image into an old masters painting, a 1950's-style movie theater card, or a piece of Pop Art. His works are framed and can take the form of a standard paper print or a laquered-canvas oil painting. Basically, Post Art's customers choose a painting and send a collection of photos that seem to fit the piece. The company then works the customer's image into the art and sends a digital preview. If the customer is pleased, Holmgren produces the canvas, signs it, and covers it in several layers of lacquer. On the one hand, Holmgren seems to be charging a lot for what are, essentially, bastardized copies of great art. On the other hand, the price of a Giclee printing on canvas and subsequent lacquering is far from negligible. If one can afford it, there's a lot to be said for blowing a few hundred dollars on a permanent piece of semi-art that is in questionable taste. If one can't, there's always the inkjet-and-photoshop route! Bruce Watson is a freelance writer, blogger, and all-around cheapskate. 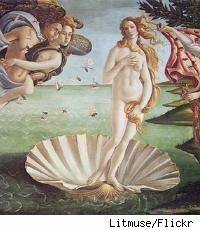 Guess whose wife is getting a mounted print of him standing naked on a scallop shell, surrounded by cherubs?